Ever wanted to be a secret agent? Raz has, and he’s so determined to become one he’s sneaked off to the special summer camp for gifted kids. See, Raz isn’t your typical geeky school-kid, he’s got psychic powers! Hearing about the psychic training camp, young Raz immediately sneaks off in the hope of becoming a fully fledged psychic agent, or Psychonaut. Released back in 2005 to critical acclaim but tragically missing out on commercial sucess, Psychonauts has since become a cult classic and is certainly one of the best platform games to ever grace the PC. It’s also really easy to get working on modern PCs and available on both Steam and Gog.com, so if you haven’t checked it out yet, there’s never been a better time. To install from the original retail release, simply place the first CD of the five CD set in your computers optical drive and follow all the on screen prompts. If the games autorun program does not start automatically, browse to the CD-ROM in Computer/This PC and run the “PsychoLauncher.exe” file manually. 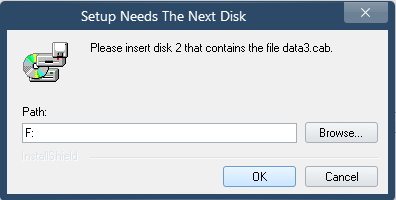 Rather than inserting the CD and clicking “OK”, click on “Browse…” instead. Now, simply browse to the folder where you copied the contents of the CD to and click on “OK”. The game should now install without a problem. Patching Psychonauts involves some choices and trade-offs, if you have the original retail release. Gamers playing using the GoG or Steam re-releases will already have the latest patched versions. For the rest of you, start by installing patch 1.4, which can be downloaded here. The patch is downloaded as a zip file. You simply need to open the zip file and run the “Psychonauts-v104-comprehensive” file from inside it. The patch will detect the games installation directory and update things automatically. Most users are going to want to install the unofficial 1.5 patch too. This patch adds widescreen support, enhances graphics, adds Xbox 360 controller support and includes a number of bugfixes. 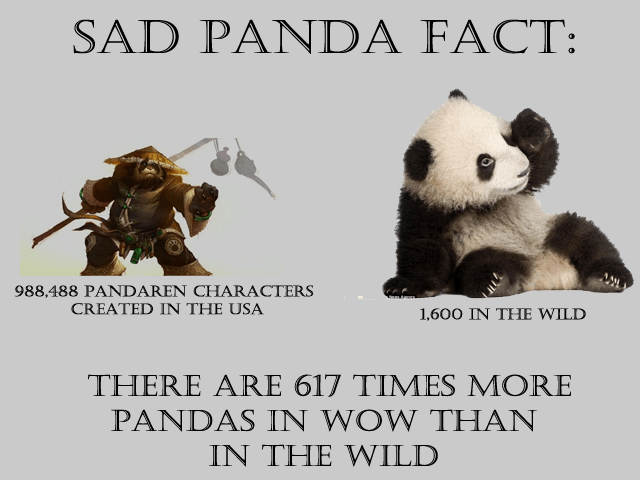 You can download this patch from patches scrolls from the same link as above. Before you install the 1.5 patch however, you should note that their are some tradeoffs. 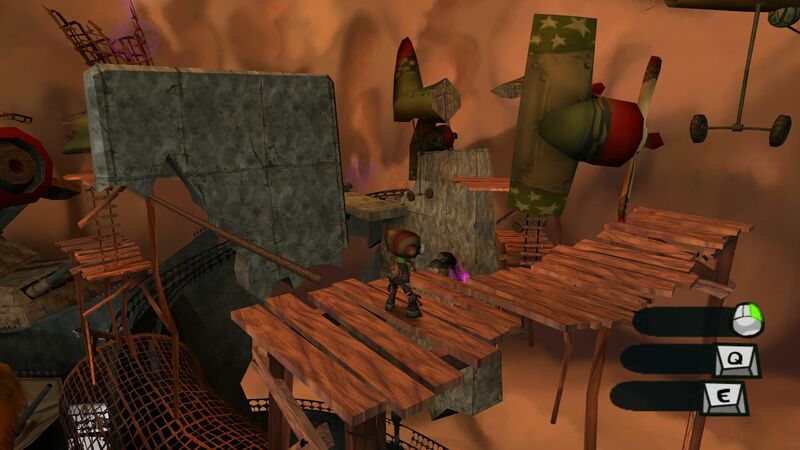 Most significantly, Double Fine simply removed all the EAX/Enhanced surround sound support from the game. The game uses OpenAL for its audio, that means it should work just fine on modern PCs. However, fans have reported that the game sounds significantly better when using EAX mode through a tool such as Creative ALchemy. If you don’t have a suitable sound card you don’t need to worry about this. If you do, just keep in mind there’s a tradeoff between sound quality and other improvements by installing the 1.5 patch. To install the unofficial patch, copy the “Psychonauts_patch_v1.05_retail_gog_full” file from the zip archive to a temporary location on your PC and then run it. Note that the unofficial patch does NOT automatically detect where you have installed Psychonauts, so you will need to browse to the folder manually. Click on the “Browse…” button and locate your Pyschonauts game folder (C:\Program Files (x86)\Double Fine Productions\Psychonauts by default), then click on “Install”. Wait while the program patches your game, the patching process should be entirely automatic. Once it is complete, you’re ready to play. v00d00man, author of the unofficial patch, promised to produce a V1.06 patch that would include better widescreen support and restore EAX options. Unfortunately, this was never released and his account now appears to be dormant on the Double Fine forums. Before you report for your basic braining, you should make sure that Raz is looking his very best. Start a game and once you are passed the initial tutorial, hit the “Escape” key. Now choose “Options” and then “Graphics”. The options shown below will appear (click on the picture to see a bigger version). The most important stetting to get right is the screen resolution, that’s the setting shown at the top of the screenshot above. Generally, you should set this to your monitor or TVs native resolution. 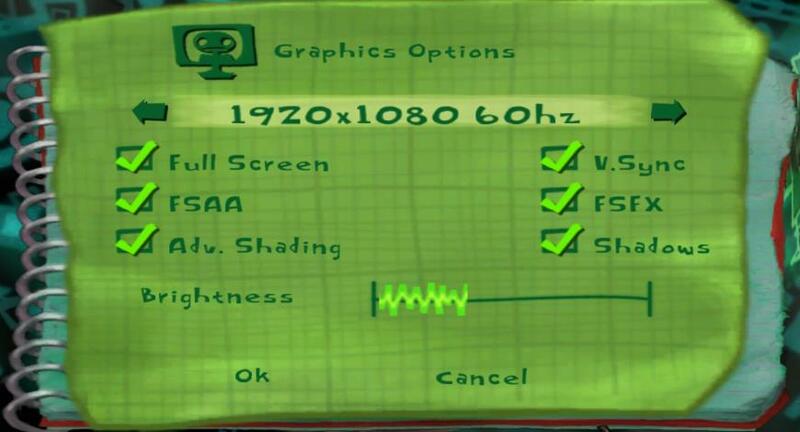 For 1080p for instance, choose “1920x1080x60hz”. If you’re using the 1.5 patch, the game has been partially fixed to work in widescreen resolutions. All the 3D in-game content should render correctly, however the games cut scenes and various HUD elements may still be stretched out of proportion, though in our opinion they don’t look too bad. If you’re using the 1.4 patch we recommend you stick to 4:3 or 5:4 (none-widescreen) screen modes instead, such as 1280×1024. Using a screenmode like this means you will get the black bars at the side of the screen, but at least the graphics won’t be stretched out of proportion. On most modern PCs, all the other options can simply be turned on for the very best visual quality. If you find the game doesn’t run smoothly, you may need to deselect some options, but most PCs should be able to handle full quality settings without breaking a sweat. Sound options can be accessed by pressing the “Escape” key and then choosing “Options” and then “Sound”. 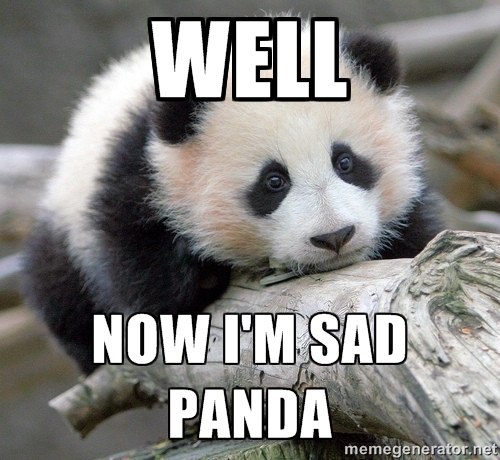 If you’re running the 1.5 patch, there’s nothing really to configure here. If you’re running the 1.4 patch, you can turn on EAX and enjoy improved environmental audio options, as long as you have a compatible sound card and you are either running Windows XP or you configure the game to run with Creative ALchemy or similar software. Patch 1.5 fixes the games controls to fully support the Xbox 360 controller. The game is automatically configured with the correct button mappings. The only downside is that, during the tutorial, the game will refer to the keyboard commands for all actions. Prolific Psychonauts patcher v00d00man also released a tool called Psychopad lite to address this issue, unfortunately it doesn’t work with the original retail version of the game, if you try to install it all that appears are purple squares where the button images should be. If you decided to stick to patch 1.4, you can still use an Xbox 360 controller, but the game will not recognise the analogue triggers at all. To get around this limitation, use a tool such as Xpadder to map the “Home” and “End” keys to the analogue triggers, allowing you to use your primary psi power and centre the camera. This game pre-dates the Xbox 360 controller, but it did appear on the original Xbox, which had a similar controller. 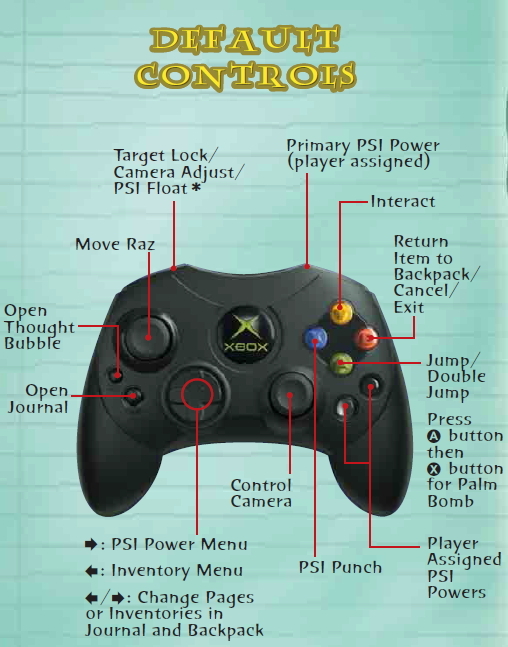 For reference, here’s how the buttons were laid out on the Xbox version. For patch 1.5 users, the controls are mapped exactly like the ones shown above. The only difference is the two small buttons in the bottom right of the controller are moved to the left and right shoulder buttons. To enter first-person view mode, click the right analogue stick. The popular gaming utility Raptr supports Psychonauts, allowing you to take screenshots and videos, access the web and chat to your friends all without leaving the game. 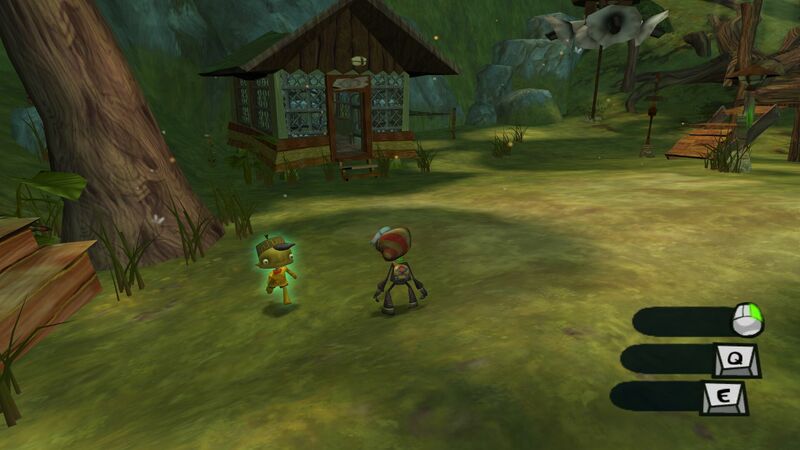 Problems saving games – Like many old titles, Psychonauts saves its game data into the same folder as the game itself. In some instances on more modern versions of Windows, this will mean that save games and configuration files cannot be written. To solve this problem you can either run the game as administrator (right click on the games icon and choose “Run as administrator”) or, better still, set the permissions on your game folder so that your user account has full control/read write permissions. You can find a tutorial on how to configure folder permissions here. The games default installation directory is “C:\Program Files (x86)\Double Fine Productions\Psychonauts”. The actual save game files are stored in the “Profiles” sub directory. Raz goes through his basic braining. Playing with the other psi-cadets.